That weekend in Milan was such a recharge! Not only we had so much fun wondering around the city during Milan Fashion Week, but as well the weather was wishing us luck. It felt so much like spring already! I wished I could have brought the weather back to UK! 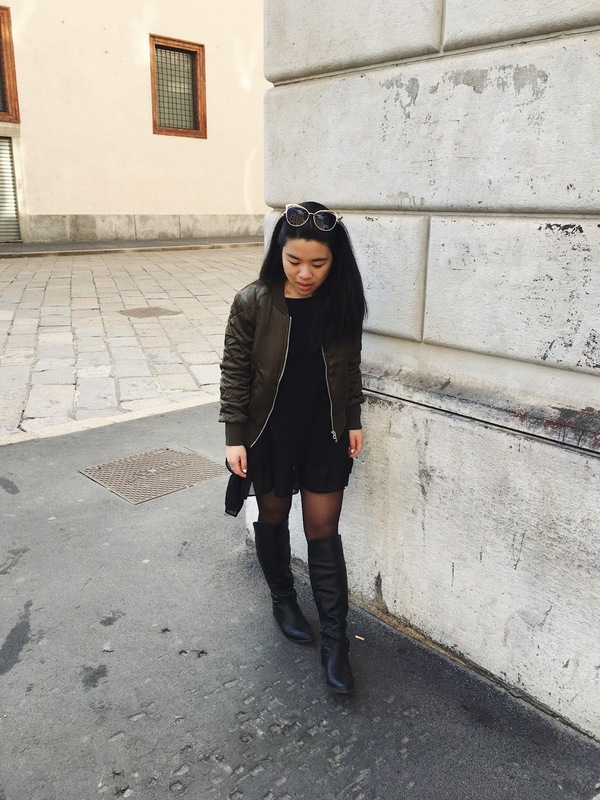 My first look in Milan consist of black little dress from Lindex, over knee boots and khaki H&M bomber jacket. I was scared that it will be cold over there, so I did even pack extra tights, long sleeve top and a scarf. However, I didn't need to be using them at all. Enjoyed combining girly look with a sporty edgy touch. What are your thoughts on this move? Thinking to be sharing my views and experiences from LFW and MFW, would that be in your interest to read?